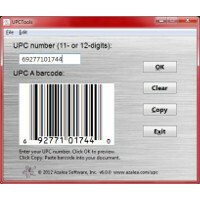 Azalea Software - Print Code 128, UPC, Code 39, and other barcodes using barcode software and barcode fonts from Azalea Software. 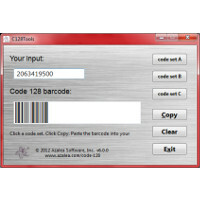 Buy Code 128, UPC, Code 39, Interleaved 2 of 5, POSTNET, Codabar and other barcode software. Make bar codes in Excel, Crystal Reports and other applications. Buy C128Tools, UPCTools, C39Tools, I2of5Tools online, all with free sample code and free tech support. Build Code 128 (subset A, B and C) or GS1-128 barcodes right into your favorite spreadsheet, database, design or labeling project. The software package comes with five different Code 128 fonts in TrueType and Type 1 PostScript format, a barcode wizard to create barcodes one at a time, and sample code to get you started in Excel, Visual Basic and SAP Crystal Reports. 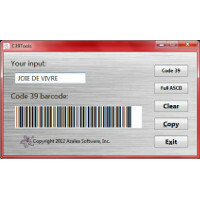 Build Code 39 (code 3 of 9) barcodes right into your favorite spreadsheet, database, design or labeling project. The software package comes with twenty-seven different Code 39 fonts in TrueType and Type 1 PostScript format, a barcode wizard to create barcodes one at a time, and sample code to get you started in Excel, Visual Basic and SAP Crystal Reports. Build Interleaved 2 of 5 (ITF) barcodes right into your favorite spreadsheet, database, design or labeling project. The software package comes with two different Interleaved 2 of 5 fonts in TrueType and Type 1 PostScript format, a barcode wizard to create barcodes one at a time, and sample code to get you started in Excel, Visual Basic and SAP Crystal Reports. Build UPC-A, UPC-E, ISBN-13, ISBN-9 (Bookland), EAN-8, EAN-13, JAN and ISSN barcodes right into your favorite spreadsheet, database, design or labeling project. The software package comes with ten different UPC fonts in TrueType and Type 1 PostScript format, a barcode wizard to create barcodes one at a time, and sample code to get you started in Excel, Visual Basic and SAP Crystal Reports.